Chien-Yuan Huang and Kuang-Ting Yeh contributed equally to this work. Spinal segment fusion is one of the most common surgical procedures used to treat lumbosacral degenerative disease . The technique most often consists of one of the following approaches: posterior instrumentation (PI) using a pedicle screw-based fixation system, posterior decompression by laminectomy and foraminectomy, or posterolateral fusion of the adjacent levels of the bilateral transverse process using chipped bone grafts . Interbody fusion has also been developed and is promoted because it provides a more solid fixation of the fused spinal segment and restores disc height and segmental lordosis . Two specific methods, namely transforaminal lumbar interbody fusion (TLIF) and posterior lumbar interbody fusion (PLIF), are selected more often than others when carrying out interbody fusion of lumbar spinal segments. This is because only a posterior approach and single incision are needed for the procedure . However, the success rate of L5–S1 fusion through the posterior-only procedure is lower than when it is used on other lumbar spinal segments, and the same technique (posterior spinal segmental fusion) is carried out . Moreover, the anterior lumbar interbody fusion (ALIF) procedure can provide enhanced anterior anticompression force by restoring lordotic curves more effectively. Such an approach avoids destroying the posterior elements, but it lacks the posterior anti-tension force production effect that is often provided by posterior fixation . Therefore, this retrospective study evaluates the surgical outcomes of patients who received one-stage ALIF surgery with an allogenous strut bone graft involving their L5–S1 spinal segment in combination with posterior percutaneous pedicle screw fixation. This retrospective study was approved by the Institutional Review Board of Hualien Tzu Chi Hospital, Buddhist Tzu Chi Medical Foundation (IRB103-189-B). The study was conducted in accordance with the Declaration of Helsinki and was approved by the local ethics committee of the institution involved. Informed written consent was waived because the study was a retrospective data analysis. Patients who had received an L5–S1 ALIF surgery involving an allogenous strut bone graft followed by a percutaneous PI with pedicle screw fixation at our institution between June 2008 and 2012 were included in the study. The participants in this study also needed to have received regular follow-up care for at least 4 years to be included in the study. However, patients who had received spinal surgery previously, had concomitant cervical or thoracic pathology, or had concomitant lower limb pathology that influenced their ability to stand or walk, were excluded from the study. The indications for this surgical method included, first, that the major pathology was caused by a degenerated disc and the posterior osteophyte of the vertebral body and second, that there was L5–S1 disc height collapse with the symptoms including compatible S1 radiculopathy and lower back pain. Those who had only or concomitant major pathologies affecting the L5–S1 posterior elements would not be suggested to receive this kind of surgical management. The clinical and radiographic data of the included patients were collected using an electronic chart review and a picture archiving and communication system. The clinical data were divided into perioperative information, such as estimated blood loss, surgical time, and postoperative complications, and functional information, such as the scores for postoperative 1-year back pain through a visual analog scale (VAS) and the patient's Oswestry Disability Index (ODI) score . The radiographic data comprised of a range of preoperative and postoperative 1-year sagittal parameters, including disc height (DH)  and segmental lordosis (SL)  for the fused L5/S1 level, as well as pelvic incidence and lumbar lordosis (LL). The radiographic information was obtained from lateral lumbosacral plain films. LL was measured using the angle between the L1 superior endplate and S1 endplate. DH and SL were measured as the height and the angle, respectively, between the L5 superior endplate and S1 endplate. Finally, pelvic incidence was estimated as the angle between the perpendicular to the sacral plate at its midpoint and the line connecting this point to the axis of the femoral heads . The surgical technique used for the lumbosacral fusion involved carrying out a combined surgical approach. Patients were positioned supine, with their legs in abduction and the lumbar spine slightly hyperextended. First, an anterior transperitoneal approach was performed that consisted of a midline incision followed by the insertion of a frozen allogenous humeral mid-shaft strut graft. The strut graft was filled up with hybrid chipped bone grafts (autogenous graft from the vertebral osteophyte, allogenous graft material, and artificial bone graft material). Next, the PI was performed using four screws and two rods (Xia cannulated polyaxial screws, Kalamazoo, USA) while patients were in a prone position, via the posterior percutaneous approach under fluoroscopy [Figure 1]. Statistical analyses were performed using SPSS version 17.0 (SPSS Inc., Chicago, IL, USA) and paired-sample t-tests were used to compare the preoperative and postoperative radiological parameters. Statistical significance was set at P < 0.05. A total of 20 patients (11 women and 9 men) with a mean age 59.4 years were included in this study. The average postoperative follow-up was 32 ± 8 months. [Table 1] shows the perioperative data and estimated the pelvic incidence of all of the patients; specifically, the average operation time and estimated blood loss were 163.2 min and 267.5 cc, respectively, while the average admission period was 5.7 days; and the average pelvic incidence was 54.9. No significant differences were noted between men and women in terms of these parameters. In addition, there were no cases of intraoperative dural tears, vascular injury, infection, deterioration resulting in a neurological deficit, implant breakage/loosening, fused segment pseudarthrosis, and/or bone graft migration/subsidence noted during the follow-up period. Although no patients were indicated for revision surgery, asymptomatic L4–L5 hypermobility with a narrowing of the disc space was noted in five cases. The postoperative surgical outcomes are listed in [Table 2]. Notably, the average VAS and ODI scores were improved at 1-year postoperative from 6.4 to 2.3 and from 33.3 to 14.3, respectively. Moreover, at 1-year postoperative, LL had increased from 32.1 to 38.8, L5-S1 SL had increased from 10.2 to 20.2, and DH had increased from 0.7 to 1.7 cm. Lumbosacral fusion is one of the most common surgical procedures for the management of degenerative disc disease. The principle of load sharing when applied to the lumbar spine reveals that the anterior anticompression force present ranges from 67% to 82%, while the posterior anti-tension force present ranges from 18% to 33% . Moreover, the fusion rate is relatively low when there is a higher rate of pseudarthrosis at the L5-S1 segment because such disease results in a wider disc space and because this is also the most mobile motion segment . This study demonstrates that positive surgical results where obtained when patients received the L5–S1 circumferential fusion described above. The ALIF procedure allows for a thorough discectomy, the appropriate cleaning of the endplates and the use of large bone grafts. On the other hand, the posterior approach provides adequate rigid anti-tension force stabilization . Thus, the combined procedures of anterior fusion and posterior fixation can achieve 360° stabilization, which effectively increases the success rate of the operation as has been noted previously in the literature . Previous literature has explored the fusion rates after the first postoperative year, for PI + posterolateral fusion (PLF), PI + PLIF, and PI + PLF + PLIF; these were 86%, 91%, and 93%, respectively, and overall fusions rates of about 95% were achieved with all three groups . The nonunion rates of these three posterior methods eventually ranged from 4% to 8%. Fusion using ALIF can reach 88.6%, but the complications associated with ALIF include a longer hospitalization and a higher level of blood vessel injury . El Masry et al. noted that performing the ALIF procedure using autogenous iliac crest bone combined with posterior pedicle fixation resulted in an even higher union rate . Here, it would seem that an allograft strut bone graft not only provides support force for the anterior column of the spine but also functions as a container for the chipped autogenous bone graft material. Unlike interbody cages, this graft enables the bones to heal and allows self-osteoinduction to occur . However, the ALIF procedure also allows cages to be inserted without opening the vertebral canal, which a likely explanation for the lower mean blood loss of our patients (308 ± 180 mL) during the present study compared to the findings when the open PLIF, TLIF, and circumferential procedures are used . Both the length of surgery and the amount of blood lost as noted in this study are comparable to those that have been observed with the single PLIF, TLIF, and ALIF procedures. They are also lower than those observed for circumferential fusion and ALIF procedures with percutaneous posterior stabilization . Limiting blood loss is critical because it affects the length of time that patients should remain in the hospital, the rate of postoperative complications, and the chances of an early recovery. Furthermore, percutaneous posterior fixation can often prevent the unavoidable trauma induced in back muscles that occurs during other posterior procedures that can be used to bring about lumbosacral fusion . In the present study, all patients showed satisfactory surgical results with little or no complications during follow-up. For this combined approach, the anterior procedure should be performed first, followed by the posterior procedure. Slightly extending the position of a patient's lumbar spine facilitates the correction of their LL during the anterior discectomy and interbody fusion procedure. Next, the patient should be carefully laid in the prone position and the bone graft position confirmed using fluoroscopy. Furthermore, pelvic incidence can also be used to determine the degree of lumbosacral disc space that has been restored. Finally, percutaneous posterior fixation using pedicle screws can then be performed through the use of small stab incisions under fluoroscopy monitoring. In short, by conducting these procedures in the correct order, a patient's lordotic curve and DH can be successfully restored. A sufficient amount of solid bone graft to fill the L5-S1 disc space is needed, and this can be effectively maintained in position through the posterior fixation. This results in the preservation of most of the posterior elements of the lumbosacral spine. The limitations of this study are its retrospective design and the small number of cases. In the future, studies that have longer follow-up periods that focus on the patients' quality of life and explore the influence of adjacent spinal segments need to be conducted. Combined lumbosacral fusion is a safe and efficient surgical technique that is able to provide high-quality spinal fusion. It effectively restores the patient's DH and SL and offers excellent clinical and functional outcomes. The authors would like to acknowledge Wallace Academic Editing for editing this manuscript. Lee JC, Kim Y, Soh JW, Shin BJ. Risk factors of adjacent segment disease requiring surgery after lumbar spinal fusion: Comparison of posterior lumbar interbody fusion and posterolateral fusion. Spine (Phila Pa 1976) 2014;39:E339-45. Kim TH, Lee BH, Moon SH, Lee SH, Lee HM. Comparison of adjacent segment degeneration after successful posterolateral fusion with unilateral or bilateral pedicle screw instrumentation: A minimum 10-year follow-up. Spine J 2013;13:1208-16. 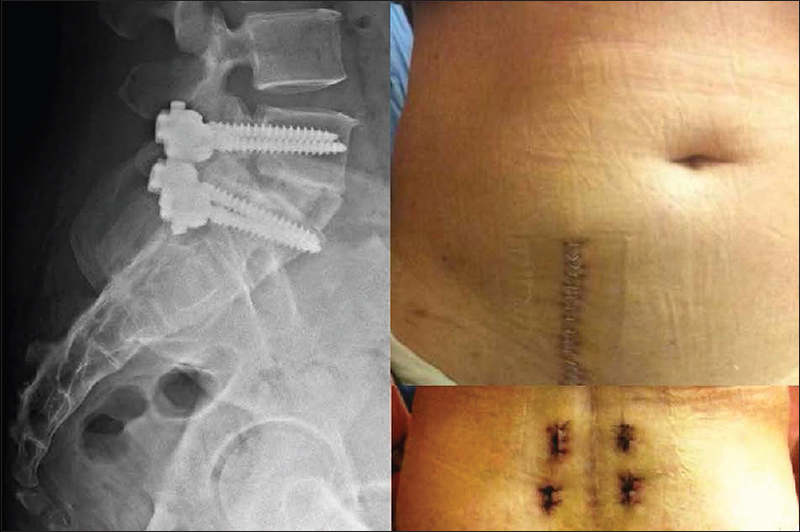 Jalalpour K, Neumann P, Johansson C, Hedlund R. A randomized controlled trial comparing transforaminal lumbar interbody fusion and uninstrumented posterolateral fusion in the degenerative lumbar spine. Global Spine J 2015;5:322-8. Lee SM, Lee GW. The impact of generalized joint laxity on the clinical and radiological outcomes of single-level posterior lumbar interbody fusion. Spine J 2015;15:809-16. Han SH, Hyun SJ, Jahng TA, Kim KJ. A comparative radiographic analysis of fusion rate between L4-5 and L5-S1 in a single level posterior lumbar interbody fusion. Korean J Spine 2015;12:60-7. Phan K, Thayaparan GK, Mobbs RJ. Anterior lumbar interbody fusion versus transforaminal lumbar interbody fusion – Systematic review and meta-analysis. Br J Neurosurg 2015;29:705-11. Brodke DS, Goz V, Lawrence BD, Spiker WR, Neese A, Hung M, et al. Oswestry disability index: A psychometric analysis with 1,610 patients. Spine J 2017;17:321-7. Akeda K, Yamada T, Inoue N, Nishimura A, Sudo A. Risk factors for lumbar intervertebral disc height narrowing: A population-based longitudinal study in the elderly. BMC Musculoskelet Disord 2015;16:344. Uribe JS, Myhre SL, Youssef JA. Preservation or restoration of segmental and regional spinal lordosis using minimally invasive interbody fusion techniques in degenerative lumbar conditions: A literature review. Spine (Phila Pa 1976) 2016;41(Suppl 8):S50-8. Drain O, Lenoir T, Dauzac C, Rillardon L, Guigui P. Influence of disc height on outcome of posterolateral fusion. Rev Chir Orthop Reparatrice Appar Mot 2008;94:472-80. Gibson JN, Grant IC, Waddell G. The cochrane review of surgery for lumbar disc prolapse and degenerative lumbar spondylosis. Spine (Phila Pa 1976) 1999;24:1820-32. Boissiere L, Perrin G, Rigal J, Michel F, Barrey C. Lumbar-sacral fusion by a combined approach using interbody PEEK cage and posterior pedicle-screw fixation: Clinical and radiological results from a prospective study. Orthop Traumatol Surg Res 2013;99:945-51. Oxland TR, Lund T. Biomechanics of stand-alone cages and cages in combination with posterior fixation: A literature review. Eur Spine J 2000;9(Suppl 1):S95-101. Moore KR, Pinto MR, Butler LM. Degenerative disc disease treated with combined anterior and posterior arthrodesis and posterior instrumentation. Spine (Phila Pa 1976) 2002;27:1680-6. Kim KT, Lee SH, Lee YH, Bae SC, Suk KS. Clinical outcomes of 3 fusion methods through the posterior approach in the lumbar spine. Spine (Phila Pa 1976) 2006;31:1351-7. El Masry MA, Badawy WS, Rajendran P, Chan D. Combined anterior interbody fusion and posterior pedicle screw fixation in patients with degenerative lumbar disc disease. Int Orthop 2004;28:294-7. Pradhan BB, Bae HW, Dawson EG, Patel VV, Delamarter RB. Graft resorption with the use of bone morphogenetic protein: Lessons from anterior lumbar interbody fusion using femoral ring allografts and recombinant human bone morphogenetic protein-2. Spine (Phila Pa 1976) 2006;31:E277-84. Kim JS, Choi WG, Lee SH. Minimally invasive anterior lumbar interbody fusion followed by percutaneous pedicle screw fixation for isthmic spondylolisthesis: Minimum 5-year follow-up. Spine J 2010;10:404-9. Zhang W, Li H, Zhou Y, Wang J, Chu T, Zheng W, et al. Minimally invasive posterior decompression combined with percutaneous pedicle screw fixation for the treatment of thoracolumbar fractures with neurological deficits: A prospective randomized study versus traditional open posterior surgery. Spine (Phila Pa 1976) 2016;41(Suppl 19):B23-9.